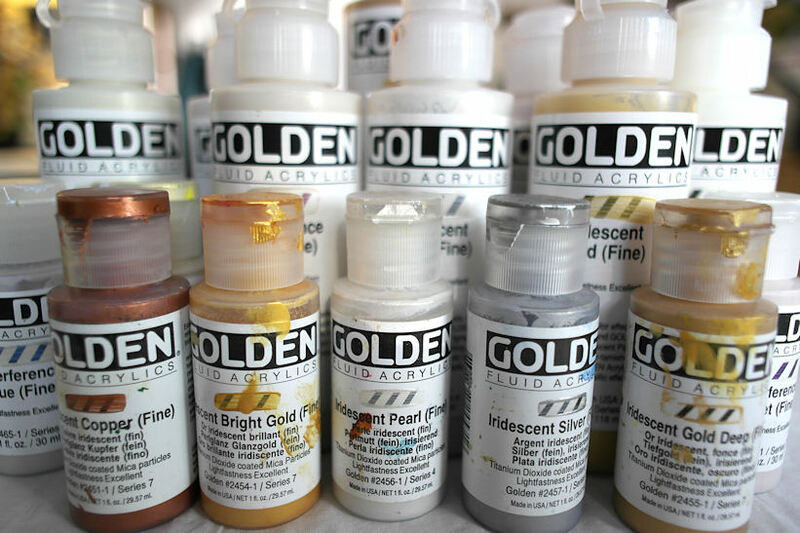 You may think I've played with just about every art product on the market at one time or another, but every year I seem to discover or rediscover something that plays an big role in my work for the year. This past year, that happened with several products that had been on the market for quite some time, but suddenly I was hooked! So here are my favorite new "older" products of the past year. 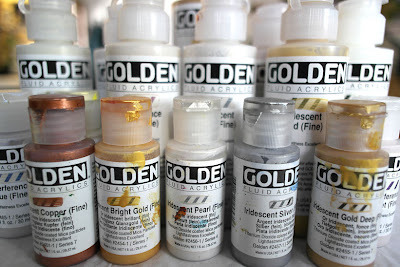 First up are Golden Airbrush Paints, used with regular brushes rather than an airbrush. I did not exactly "stumble" upon these. In spite of the fact that I consider myself to be a rather creative person, I never would have thought to give these a try! I was struggling with some effects I was trying to create with the fluid acrylics. I wanted something that would lift more easily and maintain a transparent glow like watercolors, stay put when dry like acrylics, and be able to frame without mats and glass like oil paintings. I wanted to be able to lift color to reclaim my lights, and blend better (like wet watercolor), but retain the capability of opacity like acrylics. In discussing this issue with a tech staff member at the Golden Paints factory one day, he said, "Oh, you want to try the Airbrush paints!" He pulled some out along with some brushes, and we played. They lifted. They glowed. They blended. They were permanent when dry. They are certainly misnamed as "Airbrush" paints, since no airbrush is needed! He explained that these paints have retarder built in, so they are movable for a longer period of time than the diluted fluids. I fell head over heels in love with the Airbrush paints. I bought all of the most lightfast, single pigments that were available. I took them up to Kaaterskill Falls, and the Helderberg Escarpment. I was able to formulate a small, lightweight painting kit with them that fit easily in my backpack, and it became one of my favorite sketching mediums of the year. I'm looking forward to doing a lot more with them both in the studio and outdoors. I also want to try them as an underpainting for pastels, and for transparent glazes and opaque overpainting techniques on monochrome underpaintings. I want to try them in combination with Pitt Brush Pens and fountain pens, and on large sheets of rag watercolor paper, as well as boards. So much to explore. So exciting! Most of the colors are highly lightfast. Those ratings are clearly marked on the pens, so you can select only extremely permanent, archival colors for fine art use. Once they're dry, they don't budge. While wet, you can blend the pigment with another marker, a finger, dampened tortillion or Qtip, etc. There is a large selection of colors. The big brush pens have a ton of ink in them. No need to worry about running out while working. Since they are water based, there is no odor. They don't have a tendency to bleed through paper. They can cover a large area in a much shorter amount of time than colored pencils or fine-tipped markers, yet still have a point for detailing. Convenient to carry. No palette needed. No water, paints, or spills! Here is one I just did on Sunday with Pitt Big Brush Pens, using only the Cool Greys. I added watercolor afterwards, and will post the version with the watercolor added soon. Older Pitt Brush Pens don't have the color name on the barrel of the pen. That's a real PITA when you want to reorder a color, or even identify one! The writing on the barrel is so tiny that identification by number is impossible without my glasses, and then I need a chart to find the color name from the number. This is a packaging nightmare. That isn't the only packaging nightmare either. The barrels of the pens don't effectively match the colors and values of the inks inside. This is most problematic on the sets of warm and cool greys, where lighter valued barrels contain darker valued ink and vice versa. 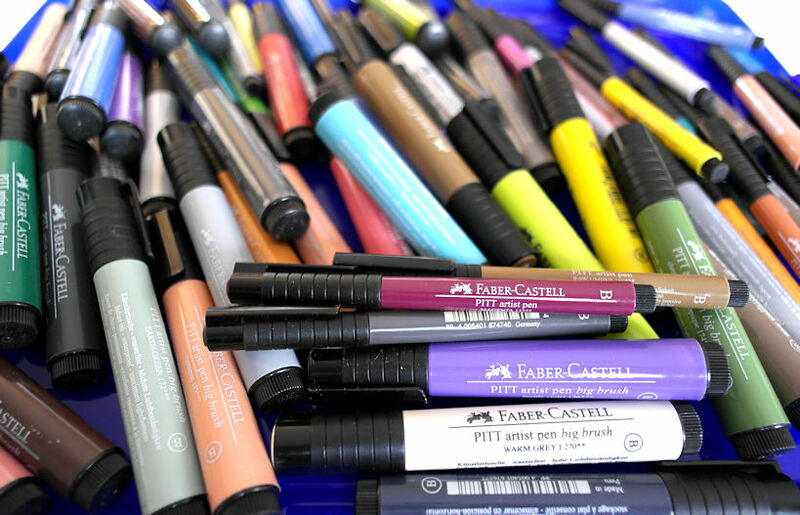 It is further complicated if you happen to have the pens without color names on the barrels, so you can't even tell by reading the name which is lighter or darker. Even if you can read which is lighter/darker, two of my Big Brush Cold Greys are actually reversed. From lightest to darkest, they go I, IV, III, VI, Black. Values III and IV are almost exactly the same, but reversed. Value I is very light as you'd expect, but the next pen available is quite dark. There is nothing in between for light-colored objects in a sketch. I think what I'll have to do is combine the warm and cool greys and see if I can get a better value scale happening, even if the colors will vary. I hope Faber Castell resolves these issues in the future. Even with those negatives, these are my favorite journaling markers for both headlines on text, borders, and sketching. I haven't found anything else that even comes close. Tombow markers and Sharpies are not archival. Copic markers bleed through everything and they smell. Many other water based markers on the market are not waterproof. Since Pitt Pens are archival, sketch work can directly translate to fine art and hang on a wall. They won't run if you layer watercolor over the top. I love the way they glide on the smooth Epsilon sketchbook paper by Stillman and Birn, and also the new extra heavy weight Zeta paper. (Zeta books should be available in another month or so.) If you want to check out somebody who uses them to great effect, take a look at Don Colley's blog! What woman doesn't like a little glittery glam from time to time? I've had a great time exploring the virtues of the Golden Iridescent and Interference acrylics in the last couple of years. 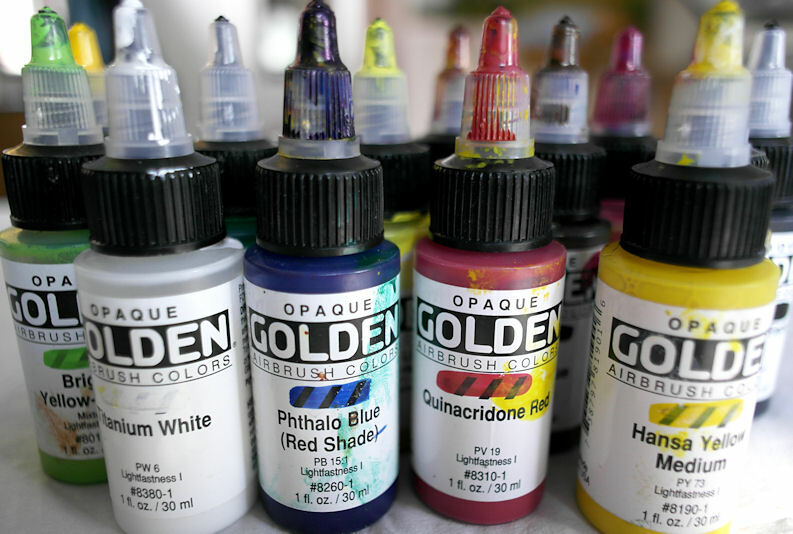 I've used them in my sketchbooks, mixed in with other colors in acrylic paintings, and to make beautiful backgrounds and borders with sponges, sprayers, stencils, and brushes. Give them a try and bring some sparkle into your life! If you'd like to see Part II of this "Best of the Year" series, click here.